Elizabeth I, Regina: the woman of many portraits. The portraits of Elizabeth I as a young woman are grave and, if not beautiful, certainly graceful; the older ones increasingly cover up a visage Oriana wanted no-one to see. Her make-up ever thicker, she used every inch of her power and wealth to portray herself as young and beautiful, even when she was old and withering physically. Because her persona was iron-strong until her death. We are much used, here in England, to seeing our history similarly artfully dressed. She wears a low-cut bodice and flutters a fan back and forth so that worldly visitors to the islands might see her to her best advantage. Thus our great castles are window-dressed with reconstructed tapestries and well-researched brand-new ancient artefacts; the old damp walls are carefully restored and repainted so that we might feel the time which has passed under History’s feet. Our old houses are arranged so that the original nestles alongside the replica, and unless we are very crafty we will not even see the joins. History’s make up is thick lead. It whitens her lovely features, and hides from us her wrinkles and a body which shows signs of ageing. Her experience is all. We all stand in awe of her, with her feet planted in the iron age and a head craning to make out the future. Just occasionally, if you are very lucky indeed, you will catch her without make up, in her chemise, an honest unvarnished woman. And today, I did just that. I paid a Queen’s ransom to get into Kew Gardens, for one day only. Because within the gardens is a gem indeed: it is called Kew Palace, though it is just a country manor in reality. And it is the place that fated King, George III, was happiest. Four palaces have taken up residence on this spot on the river at Kew. This fourth – The Dutch House, as it was known- is a modest place : the walls speak of home. Here George lived with his wife Queen Charlotte, and 15 children. Here, despite the trials of the king”s illness -now thought to be a blood disease, porphyria, but which manifested itself as increasingly recurrent bouts of mental illness – here, they were happy. Perhaps the happiness seeped into the walls. The little house has always been beloved of monarchs. Queen Victoria had it opened to the nation; the second Queen Elizabeth’s 80th birthday party was held there. Days after her party, in 2006, it was thrown open to the public once more after a ten-year restoration. Two floors are beautifully presented: arranged with sound recordings and snippets of film to tell the story of the house’s history. Historic Royal Palaces, the independent charity which also runs Hampton Court, has once again woven its magic with this little gem. But what a bold choice HRP has made for the third floor. A guide took me aside as I headed enthusiastically up the staircase. “You’ll find the third floor quite different,” she said seriously. The rooms on the third floor were used for the two princesses, Princesses Augusta and Amelia. They ceased to be used in 1816: and throughout Kew Palace’s open-door times, this floor was never opened to the public. For two hundred years, these rooms were mothballed. HRP has decided not to dress them artfully, but to show them as they were. In their proverbial chemise, with no make up. And the result blindsides you, as you walk up the stairs. The beauty of the battered panels and staircases outstrips by far the grandeur of the lower floors. For this is history undressed. Take a look: the pictures of the second floor come first; the lower floors second. Posted in London, Places to visit, UncategorizedTagged histiory, Historic Royal Palaces, Kew Gardens, Kew Palace, King George IIIBookmark the permalink. I so look forward to such pieces by you Kate. They just transport me to a whole new world. We used to live in a road leading off Kew Green, and visited the Gardens often, but foolishly never the Palace. Wonderful pictures of the raw state leaving us to imagine the elegance that must have been. Walking there was a strange experience: like someone had taken out all the interference and I could just concentrate on the simple truth. Probably a romanticised view. But I loved it. I have seen many pictures of the gardens, but never of the interior of the palace. Thanks for the tour of the palace. 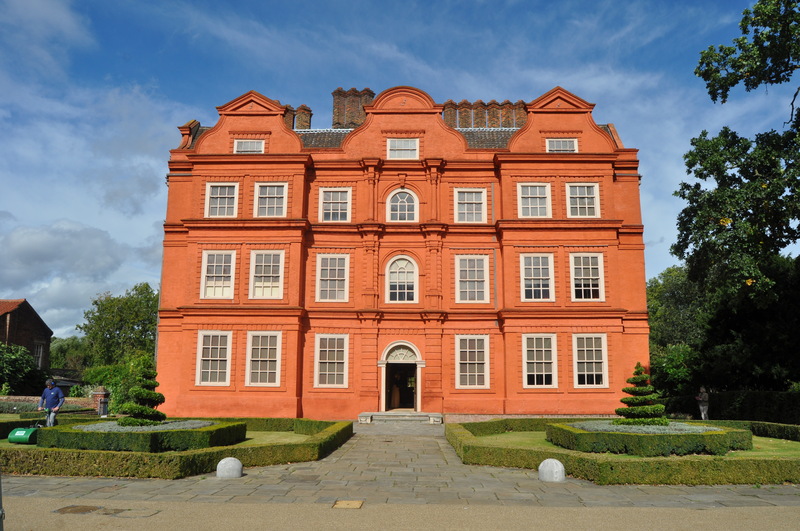 I don’t think Kew Palace would ever have been furnished sparsely, Wanderlust, as you say – not even the top floor. I suppose what struck me was the fact that this was almost a primary historical source, unmeddled with, as it were. Wonderful photos, the differences in the floors are indeed striking. Very courageous of HRP to leave it there, Lou. But very effective. Than Kew for the tour! I wonder if lack of funds made that presentation of the top floor to be virtue out of necessity? In any case, it works wonderfully to give, as you put it so well, ‘history undressed’. Not usually, Col.We have season tickets to the National Trust , Historic Royal Palaces and English Heritage, so we pay a small flat fee once a yea and brandish a ticket on entry. Most satisfying. But Kew was an exception: it’s in Kew Gardens, and we must pay their fee to get to the HRP building. A luxury to visit, and I went on my own. Which was heaven. And the contrast is what makes these visits so interesting. If you are in Scotland at any time make a visit to Traquair House. Don’t bother with all the modern trappings, just look at the house. There is a vast a contrast but on a different level. http://www.traquair.co.uk/ Thanks Kate, another really interesting post. Thanks for the recommendation, Myfanwy! Kew. It has always been on my list, including the palace. Thank you for *almost* getting me there today, Kate. We have a whole house in Charleston that is preserved like the upper floors at Kew. http://www.draytonhall.org/ Groups have come over from the UK to study it as a model of its kind. Its website looks wonderful- I shall take the virtual tour later, cup of tea in hand. A brilliant philosophy, preserving so faithfully. The overview does give an excellent example of the sound of an Old Charleston accent. I have always found the unvarnished historic structure much more evocative than the ones “all made up”. As an architect I can see them unmaking themselves – their bones beginning to show themselves a bit. But mostly because them seem to share more of their story in the cracks and worn spots than they ever do when dressed in full regalia. Great post. You put it so well Alice, thank you for your comment….you’re right. The story is much barer and easier to read on the bones of a house. Fun tour! And congrats on being Freshly Pressed! Though the restored portions are lovely, I also prefer the “undressed” floors. The woodwork, the stair balusters, the hardware on the doors are all evocative of craftsmanship that’s hard to come by today. Thanks for the tour! You are right, and that’s something I hadn’t thought of before: craftsmen made these places, with traditional skills. And you can still see their handiwork today. Thanks, Karen! what a neat idea, leaving a floor as it was, instead of trying to take you back in time with paint and makeup 🙂 Your writing is, as always, amazing! Ah, Kate, as much as I love all of the ornamentation, this glimpse up onto the third floor is awesome. An interesting decision to leave the bare boards and battered bannisters; those things that show the bones of the building. Thanks for the sharing and a different perspective to someone who has longed to see the gardens. Penny, I thought of you all the way round. It is Autumn and Kew is a little battered from the early storms we have had. But there was so much to see. I shall post about it later – a brief but rather wonderful visit. Was Oriana actually Elizabeth’s name? I never knew that. The pictures are great, and well done to them for leaving the rooms as they were, you can feel history just looking at them. I have a habit of referring to her that way, Tinman: I was a madrigal singer and used to sing The Triumphs of Oriana, a set of madrigals by old English composers who included the words ‘Long Live Fair Oriana’ in their pieces, traditionally thought to refer to Elizabeth. Recently scholars have cast doubt on Oriana’s identity: but old habits die hard and I can’t think of Elizabeth as anything but fair Oriana. Just the colour of the building is beautiful…love the dining hall!! It was lovely…especially with that fruit display! Dear Kate, there’s a eon of difference between the old, unfurbished, and the new. But I’m wondering this: During the time of King George III–when he and his wife Charlotte and their fifteen children lived there–were the walls painted, carpets laid, furniture kept gleaming? Or was there a drabness to the home then? Certainly, the crafted objects that are part of a home–like doorknobs and cane-woven chairs–were there and they retain their beauty. But what about walls and floors? The garden seen through the window. Would that be such perfection all those years ago? You see how little I know about past life. Peace. The floor was home to two of King George’s children, Dee: and therefore it would have been very comfortable. For me, though, any attempt to reconstruct that without some idea of how it really was would be just redecorating. I like to see the bones. The view from the window would be different because there would be another palace in the way, in one direction – The White Palace – and an avenue of trees leading down to the river in the other. Love that you had a chance to soak it up in peace, Kate . . . thanks for the share. I am glad you take us along on your homes tours, Kate. The sparseness of it striking, especially in the face of the lavish renovations below stairs. It would have felt homier then, I imagine, but much like seeing the photos of the Queen mucking about and barbeqeuing in Scotland, it’s nice to see the more casual side of the monarchy. It is, Cameron: it was such a humble house for a king, really. And the family stayed there because it made them happy. I do love to see accurate historic replicas. But the top floors are a bit austere. I also fancy rooms decked out so that they look like they are fit for royalty. I’m surprised that the HRP allows visitors to see the unrenovated third floor in its raw state. Overall, it looks like a lovely place to visit. Thanks for sharing the terrific photos. I wish I could climb into one and be there myself. Maybe Apple is working on an app for that. You put it perfectly, Debra. That’s exactly how it was. What an interesting tour of Kew Palace, and such a striking difference between the floors. We used to be members of the National Trust etc., when we lived in England and as long as you are interested enough to visit a few places each year, it is well worth the annual fee. The National Trust, English Heritage and HRP are the only reason I get to see so many of these beautiful places, Marianne. Their season tickets are invaluable, aren’t they? Thanks for those up-stairs princess rooms. Yes, it does make me feel better about my surroundings, Waywardspirit…and you are right. Varnished, unvarnished, both have their moment. I share the sentiments of others, about the beauty of the unfinished rooms. I know they look more “accurate” when dressed, but when they’ve left a room as it was, I feel closer to the actual history than when a room has been renovated and painted and furnished within an inch of its life. Hope you haven’t drowned in a sea of FP comments! !